But first let’s take a selfie! So. Much. Eating! When you’re in a new town, it’s important to taste the local cuisine, right? Not to mention, these girls are pretty much over university meal-plan food already. We have enjoyed lots of lobster and sampled many local restaurants. It was a great weekend all around. Loved spending the time with my girl, shopping, walking, eating, movie-watching, bus-riding, and being tourists in Alex’s new town. 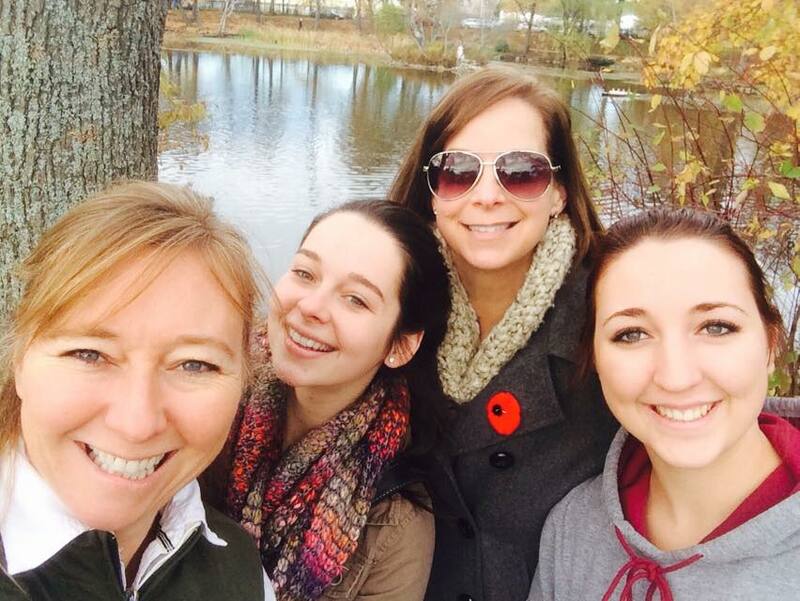 I also really enjoyed the fact that Alex’s friend Megan invited her own ringette-loving mama (Nancy) for the weekend. Nancy is super-cool and had the same philosophy as me: to let the girls direct, and follow their lead. It was such a good call, because we got to see the town through their eyes, run for a bus we thought we’d miss (only to burst onto the bus in a fit of gasping laughter and probably scaring the other riders), source cute guys (for the record, anyone Nancy and I pointed out was a No), and just enjoy each others’ company in a totally relaxed, unplanned way. Tags: elder daughter, friends, moms, university | Permalink.